Standing on a two-block parcel on a high hill overlooking Grove Street, the old Mercy Hospital’s blue tile front wall still beckons drivers off of the busy Clay Street thoroughfare. But the massive building is no longer a hive of activity, instead walled off from the community it once served by a high fence with razor wire on top. Even the nearby doctor’s offices that once served it have been vacated or turned to less intensive uses. The hospital was the epitome of the post-World War II hope in modern medicine when it opened in May of 1957. Back then, the Vicksburg Evening Post ran a special issue describing the building, the leadership, the doctors who would staff it, the medical miracles that would be able to be performed there. Here’s just part of one of the articles from that issue. Completion of the new Mercy Hospital-Street Memorial, three-million dollar structure, along with the Street Clinic and other adjoining facilities, is heralded as an important step forward for Vicksburg and this entire area. The new 200-bed hospital gives to this section the newest and most modern facilities. A shining achievement for Vicksburg, many are expected from over a wide area to attend the dedication and opening on Wednesday. Located on Grove street, one block north of the Memorial Arch on Clay, the new hospital and its adjoining buildings stand on the brown of a ridge that falls away toward the surrounding sub-division, Wildwood. The site includes some twenty-six acres. The hospital was constructed by Seth E. Giem and Associates General Contractors with Raymond Birchett, native Vicksburger architect and engineer. The main hospital building and its adjoining units form a huge U. The out-patient division is built adjoining the hospital but on a separate site. A beautiful chapel, constructed from private funds, is adjacent to the hospital and is accessible by means of a covered walk from the main building and to sisters and student nurses passing to and fro. Just beyond the chapel is the nursing school and education building. This, too, is connected to the main units by covered walkway. The hospital is completely air-conditioned. Located, as it is on top of a hill mass, about forty feet above the road elevation at Grove street, the new hospital units command an impressive view from surrounding areas. The building site was graded so as to provide the main entrance and ambulance entrances to the out-patient division at one elevation and all service entrances on the west side at a lower elevation. Ample roadways and parking facilities for all points at the hospital have been provided. An access road for service vehicles was provided from Grove street into the courtyard. With the Administration and Out patient division areas to the north, with easy access from Grove Street, the nursing units are to the south where they receive southern sun and prevailing summer breezes. While the new hospital is designed for 200 beds, provision is made for adding fifty additional beds on the fifth floor at a later date. Plumbing connections, elevators shafts and dumbwaiter service for nursing stations were all included to provide for this future addition. The hospital proper is divided into nine parts. These include the Administration, Adjunct Facilities, including Pathology, Radio and X-Ray Therapy, Hydro Therapy, Electro Therapy, Pharmacy, Nursing Facilities, Nursery, Formula Preparation, Surgical Department, Obstetrics, Emergency Service Facilities. The Administration suite is adjacent to the main front entrance. It connect to the walk leading to the chapel, and nursing school. Space is provided for main lobby and waiting rooms, admitting office, Social services office, Information, PBX and tube room. Administrator, Secretary Director of Nurses, Director of Nurses, Director of Nursing Service, Director of Personnel, Purchasing office, Business office, Bookkeeping and Insurance offices, Business machines office, Record room, Staff lounge, Chaplain’s office, and Reference library is on the top floor. Drugs from the pharmacy will be dispensed to out patients through the business office with pharmacy located directly behind the business office. Vicksburg Evening Post, Tuesday, May 7, 1957, p. 1ff. Mercy Hospital served Vicksburg and western Mississippi for several decades under the leadership of the Sisters of Mercy, who had a long tradition of nursing service in Vicksburg. 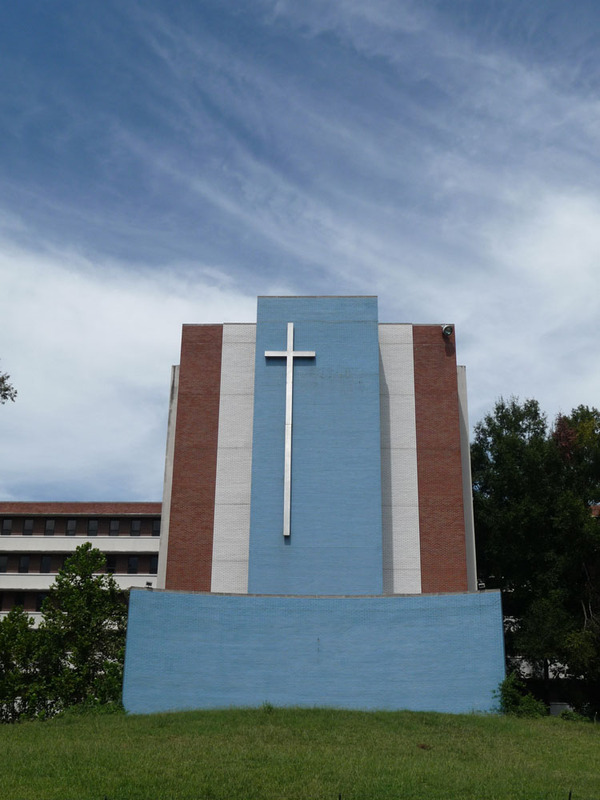 Mercy even played a role in the establishment of a nursing school at USM in the 1960s. But changes in the medical industry (implicit in the new term “medical industry”) forced them to sell the hospital in 1991 to a group called Quorum Health Care. After that, my research gets a bit fuzzy because I haven’t been able to establish dates of when the hospital finally closed and whether the new River Regional Medical Center on Highway 61 is considered a successor or is a new hospital entirely. I’m sure, given the community that has grown up around the Kuhn Memorial Hospital post, that there are people out there who will help us with our dates and facts. My best guess is that Mercy closed around 2000. I suppose it’s too much to hope for in a town like Vicksburg that this hulking modernist pile will ever be fixed up and given new life. Meanwhile, I’ll still enjoy looking over at the blue tile wall with the cross on it whenever I’m passing by on Clay Street. more Abandoned Mississippi . . .
Too bad it can’t be turned into a hotel. it would certainly be better than the plastic palazzi built by the casinos. Why it can’t be turned into a hotel? Is this building for sale, and if so, how much? It is a “dog ate my homework” of an excuse that asbestos or the cost of its remediation would prevent a project. Even if the hospital were to be demolished any asbestos would still be subject to remediation and the associated expense. Asbestos should not prevent this or any structure from having a new use. Don’t believe me? Check out this Asbestos factory that was converted into a green office building. I went to nursing school here in mid 60’s and to see it in this condition makes me sick. The city should use it for something. Shame on the city of Vicksburg. Cathy I see from your post that you went to school at Mercy in the mid 60’s. So did I. Your post only showed your first name and I have been trying to place you. If you remember me please message me on Facebook. Bea Blackmon (I was a Coventry back then). It wasn’t closed on 2000, my daughter was born there in April of 2001. My first child was born, Nov. 2001,at “Mercy” which was named Parkview at the time. Three months later a friend had her baby at River Region. Hope this helps with the time line a little. They need to update the pics.. We have cleaned the outside up a good bit. Now for this place to ever be used again it would need extensive remodeling. VPD wasnt doing their part a couple years back and copper theives got in and tore it up. We have cleaned it up since then but there is water damage now since they clipped water lines and everything else they could get their hands on. The company that owns it has numerous times tried to get something going with the building but no one wanted anything to do with it. Keep in mind, we are trying! I personally love the place and hate to see it as it is but there is only so much we can do. We now have cooperation from the VPD for the most part, after a truck load of our copper was stolen from their yard!! Keep your heads up on the place. Something may happen with it before long. They have poured alot of money in it since we started taking care of the place in 06. They just cant seem to get a bite on the building. Maybe great things will come out of it soon. By the way, if you know anyone even speaking of trying to go in and walk through, be sure you let them know that we will prosecute to the fullest extent!! Before the thieves came and tore the place to pieces, the owner would have let anyone just go through and check things out but there is no hope in that now. Keep in mind, before these people broke in, there was still alot of hope for the place and still had power and working plumbing to where now its a shell with a few decent floors. There are no vines on the building or elevator shaft anymore.We have done a good bit with the place since someone took these pics. Are people allowed to go in? Is it guarded? No it isn’t open, and a high locked fence surrounds the property. No trespassing! Hi Kevin. We have a Veterans program that we are looking to relocate from Pensacola, Florida. The old Mercy Hospital would be a perfect fit for what we do. We are used to renovating buildings in need of restoration. Think it will be a grand adventure to rebuild this great historical landmark. Will be setting up an appt to view the building in the next few weeks. Any info you have would be greatly appreciated. Kevin. could you please email me. I is very important. It is about the possibility of me trying to purchase the hospital. Kris, the COO of the Street Clinic that is across the street from the hospital told me to tell you to call him. His name is Greg Pearson and his number is 601-883-5000. Also please make contact with David Gibson, a local citizen who lives behind the hospital. He is working with a group who also wants yo purchase the hospital. His number is 601-636-0987. I was born here January 28th 1995 !! Awww!!! It’s hard to see this. I went to nursing school there. I Graduated in 1964 and spent the next 3 years working in surgery there, until I moved along to experience the rest of my life. I have been retired from nursing since 2003. How time flies. Hi Kathy! I was born in Vicksburg at Mercy in 1962 and remember many visits there while growing up. Dr. Jarrett was my pediatrician and he had a nurse (sister of Mercy) that was referred to as “Bobo”. I vividly remember both she and Dr. Jarrett! Gosh, I saw Dr. Jarrett for YEARS, then another doctor ? (Maybe Kiley?). Anyway, I know Dr. Jarrett has been deceased for years and wondered if you remember his nurse, Bobo, or other pediatricians there between 1962 and 1970? Yes, time DOES fly! Susan, Dr. Jarratt’s nurse was named Bobo BUT she was not a Sister of Mercy. Dr. Horn was the other well known pediatrician. All three of these mentioned are deceased. Left me with fond memories. Dr. Horn was a Pediatrician in with Dr. Jarrett from1960 until I left in 1968. I am a 1963 graduate of Mercy Hospital School of Nursing.. Afrer graduation I worked on OB there for about 4 years. I drove by there on a recent visit to family. It made me sad to see empty and abandoned. It was a caring place to work and learn. The best during its time. I have been gone from the area since late 70’s. It is hard for me as well. My nursing school in El Dorado, Ark closed and 5 members of my class transferred here for our senior year. We graduated in 1967 just as the new affiliation with Hattiesburg was starting. I have fond memories of studying in the Battlefields, sitting on a cannon, then walking back to our dorm behind the hospital. This was back when the US had the best medical care system on the planet and this hospital was a shining example of it. We have been going through the extensive sets of blueprints and bluelines for this hospital which are contained in the Birchett-Montgomery Architectural Records. This was a huge project which generated copius documentation for both the original buildings and the alterations and additions, 1954-1967. Most of the documentation survived, although it seems that for the most part, the original plans are not in these records which are in Special Collections, Mississippi State University Libraries. Perhaps they were given to the client? I was born at Mercy Hospital in 1968 and my brother was born there in 1972. I am visiting Vicksburg now and I was looking for the old hospital site when I ran across this article. This is a great article, thanks. My daughter, Rachel L. McGaha was born there on March 7, 1990. I was born there on April 6, 1965. I adore this landmark. It was Parkview Hospital when she was born. My pediatricians were Kimble Love and Dr. Horn. Rachel was delivered by Calvin Poole, and her pediatricians were Bobby Ford and Dan Barnes. Mrs. Pharr, whose son went on to being the Commandant at West Point, was my pediatric nurse. She still resides in Wildwood Subdivision behind the Mercy Hospital. She is in her nineties. Is that building for sale, if so how much? I was born here in 1974. I have fond memories of my visits there as a child. Dr. Love and Dr. Horn were my doctors until Dr. Weiland took over. I had the pleasure of her looking over my second born daughter in 2005 at River Region after we evacuated for Katrina. Breaks my heart to see the Mercy just sitting there. I have vivid memories of the back parking lot elevator and the colorful 70’s theme furnishings. It also makes me sick to see the old Mercy Hospital just sitting there along with the Street Clinic for I retired from there after 45 years of service. I also live in Wildwood and I am a neighbor of Mrs. Farr, retired RN who was the night supervisor for years. She is is her mid 80s and still very active. Dr. Bob Ford, Dr. Rusty Barnes and Dr. Geri Weiland are still practicing. Mercy was a top notch hospital and I thank the Sisters of Mercy for that and for the fond memories. I remember this hospital well. I worked there during High School in the evening and during the summer as an orderly back when a Hospital was a real hospital where caring nurses and staff provided real patient care. The Sisters ran it with authority and care for the people who came through its doors. I wish I could say the same about hospitals today. It was always spotlessly clean and maintained at that time. It made me proud to work at such a facility. It saddens me to know that it has been closed and left to decay. Hello to anyone interested in the old Mercy Hospital. We have done a second, more thorough walkthrough, courtesy of the owners, just recently, and were very impressed! Yes, it needs cleaning and some replacement of stolen plumbing, but overall, it’s is great condition. We are currently talking with the owners about purchasing this great facility and doing a Veterans recovery program there. The owners have been so wonderful to us and have gone out of their way to work with us in viewing the building. Once we agree upon terms with the owners of the property, and we hope it’s soon, we’d love for anyone ever born there, worked there, knew someone there, to set up a time for a re-visit. For anyone interested in helping out in any way to rehab the property, let us know so we can meet and make some plans. She’s an incredible facility and the maintenance guys the owners have are doing an excellent job at keeping her clean! We’ve been searching.for the right building for over two years and we’ve seen some buildings in really bad shape. Who did you call, or who did you email to get a walkthrough? Me and a couple of my friends who love abandoned photography and are big in taking pictures of abandoned places have been wanting to get in here for awhile now. Just wondering what the latest may be on being ole Mercy back to life. Would love to have an update. I think I was one of the early babies born in the new hospital – August 30, 1957. And spent many days in residence throughout an early childhood of severe asthma, including one Christmas. As a Presbyterian, I was quite intrigued by the Sisters and all the trappings of Roman Catholicism like crucifixes and religious statuary – then spent time here during high school as a Candy Striper – along with Helen Carter, and a couple of girls from Utica and Raymond, I think. I can do “hospital corners” on beds today because of those years. My first encounter with Mercy Hospital was when Dr. Messina placed my mother In the hospital for breast cancer and surgery. Next was having a reaction to penicillin in the emergency room when it was on street level. Then 1970 having my daughter there a patient of Dr. Horn, then going to LPN school followed by RN school there and working with the wonderful Shirley Farish and the sister of Mercy, who made me proud to be a nurse and go as far as possible, I was really upset when I visited last year and saw the hospital closed. I have worked in many hospitals and can say Mercy was the best and cared about the patients, the staff, and anyone who need them. I can go a step farther to tell you how wonderful they were. My child was ill and it was discovered that she had a brain tumor, and I can tell you I may have be at the University of Mississippi with her but several of the nuns and father were with me and came anytime I need support-to the point of being with me when they told me it was inoperable. They went as far as watching my child so I could complete RN School, and I will never be able to say thanks enough to them, and the whole hospital staff of Mercy. I pray that someone opens that building and use it for God’s glory. I went to nursing school (RN) at Mercy and stayed there for 45 years. Many, many good memories. We provided excellent care. Would love to write a book. I also live directly behind the hospital. I pray that someone gives it new life. I did retire in 2003! However the memories remain. My mother, Tess Marsalis, worked at the Street Clinic for Dr. Gus Street. We lived on Claremont Circle in Wildwood. I would get off the city bus at the bowling alley, walk through the hospital to see my mom, then walk the rest of the way home. That hospital/clinic was like another home to me. My husband and I moved to Gulfport to teach in 1972, but when we go back to Vicksburg, we always try to ride by the hospital and through Wildwood. Great memories. happy memories of the hospital and Mercy Hospital Street Memorial School of Nursing.I retired from Nursing in 2005. I was born in this hospital on April 29, 1993 and I remember when they built the new hospital River Region in 2001 or so.. I guess when river region came up Park View went down…. But I still think that park view had many more skilled nurses and doctors that actually knew what they where doing.. I really would love for it to be restored and opened back up as a hospital.. Not a hotel. That would be one haunted hotel if so lol.. I was born here in the summer of 1991. I recently heard that this hospital is now haunted? Anybody know if there’s any truth to that? What would happen if someone got caught in there? I really want to see the inside of it. But do not want to get in any kind of trouble. If you have any information, and or pictures/websites with pictures please reply! Thanks! If you get caught in the gates you will have trespassing charges pressed on you and you will go to jail. Yes security and cameras are in place. I spent more than a few hours in the ER getting sewn up after football practices and games at St. Al. My first and third children were born there in 1964 and 1966, respectively. Went to Mass in the chapel many times. The hospital was superior. What a loss for my hometown! As a former employ of River Region Health System, I can provide a little bit of information on the retirement of the old Mercy Hospital building and moving to the new facility on Hwy 61 North. The move was completed on February 17, 2002. The decision was made in the late 1990s that the two hospitals in town should be combined into one facility. The Vicksburg Medical Center located on I-20 was owned by HCA in Nashville and Parkview was own by Quorum in Brentwood TN. The Vicksburg Medical Center facility was sold to Quorum in mid 1998 and soon afterward the integration of the two hospitals began. Since both the Vicksburg Medical Center and Parkview were older facilities with limited space for expansion, plans were made to look for a new location to build a brand new state of the art facility. Many of the internal infrastructure systems of the old Mercy Hospital/Parkview, were in desperate need of repair and replacement. One example would be the HVAC system. During periods of changing weather, it would take approximately 24 hours to switch from heating to cooling or back again. This would often cause discomfort for staff and patients when the Mississippi weather would swing wildly. Also, parking was becoming a large problem at the facility. There was very limited parking place on top of the hill for patients and family members. This required many to park at the bottom of the hill or in the Street Clinic parking lot, and walk up the hill. We did have a golf cart that would help transport people from the bottom of the hill to the top of the hill, but it wasn’t always enough. During time of bad weather, the act of getting people up to the top of the hill was much worse. After the move to the new River Region Medical Center in February 2002, plans were in place to sell the building to be used for different purposes. One plan was to sell it to one of the universities to establish a nursing school. Many of the plans would fall through and nothing much has happened with the building since then. This will be a large cost in getting the building back up to standards as the building as a large amount of asbestos in it and some of the areas will need major renovation. Black mold was a problem in the building even before we moved out. Since the building has been vacate for so long, this will be a major issue to resolve now. As a former employ, I enjoyed working in that building. It was a very interesting building to be in. We always had curious sounds that we could not figure out where they came from. There was always more then one “interesting” way to get to other parts of the hospital. It was a running joke with some new employes that you could work in the building for a month, and never take the same path twice to get somewhere. I would love to see that building remodeled and used for something great. I have many fond memories of working in and around that building for years. I worked in the lab at both Parkview and the new River Region. I worked the last day Parview was open….. such a sad day. The “CDU” Chemical Dependency Unit was still open on the Parkview lot when I finally stopped working in for River Region in 2008. I drove to the property not to long ago while back in Vicksburg and it was closed…. not sure when that happened. I was working in CDU when the patients were moved to the new (River Region) hospital in 2002. At that time We had a burial of a time capsule and an old New Orleans type parade on the campus. So sad. Then after 45 years of working in the hospital on the hill on Grove Street I retired. Now for about 15 years I have been a volunteer in the gift shop. Such fond memories at Mercy. What an outstanding hospital with excellent care. I was born at Mercy in 1962. Does anyone know who the obstetricians were in 1962? Thanks! Dr. Jack Birchette, Dr. Tom Mitchell and Dr. R A Street. I graduated from RN school there at Mercy in 1961 and stayed til I retired in 2003. Lots of precious memories. The building—-Mercy Hospital, still sits empty. And, the Street Clinic building will be moving to their new medical building right next to the hospital on Hwy 61N. However, I heard that the Street Clinic would be used for physicians that want to rent. Hope it does not become vacant for I live in the subdivision right next door. So convenient all the yrs at Mercy which ended up being 42 . Fond, fond memories. Shirley, I am in the process right now of trying to get funding to buy the hospital property. I have a deep respect for it’s history and would like to turn it into a Christian Community Center. In this I am in hopes of opening a Private Christian School along with using the Hospital for a Christian Retreat center and the street clinic for community classes such as art, paint, community choir and band, cooking and canning classes etc for the community! I know it is a big project and but it is something that God has put on my heart so I am working on it now. I am praying that I will have possession of the property soon so that we can start fundraising and working on it. I think this would be good not only for the city and the community but also for the neighborhood surrounding the hospital. Just keep me in your prayers that God’s Will may be done and this property can be turned into an beautiful assets for the community. Kris, it is a sad day today in seeing items being moved out of the Street Clinic to the new medical building on 61N. The three Doctor Street brothers were the founders of Mercy Hospital and the clinic. We were considered as the Mayo Clinic of the South. I spent 42 years as a nurse at the hospital plus I have been living in the neighborhood since 1995. I pray that your plan goes through. We do not need another empty building. We were just talking about Dr. G on Thurs. He was a General Practice physician and delivered babies. He married Magprgaret Webb who was a dietitian and she lived in the same house as us—-the student nurses. We Would watch them court. They both are deceased. My older brother was transferred to Mercy right after he was born. He had major surgery when he was 3 days old. One of the first babies to survive the surgeries he had. I am told the Sisters took great care of him. I was born there in 1959. I would to see something done with the building. Please keep us posted. I born there in May 26, 1978. I was born there in 1967 and Dr. Jarrett was my pediatrician. So glad I found this thread. I was born at the old Mercy in 1947, and my mother, Tess Marsalis, worked for Dr. Gus Street and filled in for Dr. Jarrett’s nurse sometimes too. Later she worked for Dr. James Kiley. Dr. Jarrett was my pediatrician and once in a while I saw Dr. Horn. I loved the doctors and nurses at the Mercy/Street Clinic…they were like family to me as I grew up around that place. Dr. Guerrero, Dr. Mitchell, Dr. Ferris, Dr. Gus Street, Dr. R.A. Street, Dr. Dominick, and Dr. Emery were some of the names I can recall. Some of them lived in our subdivision, Wildwood. Judy, I remember your mom very well and of course I remember all the doctors you mention. I moved to Wildwood in 1995 and boy was it convenient with working at Mervy. Now, it seems that your mom may have worked with WES after she left the clinic. I just recall her bringing in employees in to the ER when I worked there (25 yrs). and June Emerson who worked for the urologist whose name escapes me. I saw June when my mom died as she came down the graveside service at Hermanville. Yea Judy, BoBo was Dr. Jarrett ‘s nurse and June worked for Dr. Hinman. June and I were in the same nursing class (1961) at Mercy. We at first lived in the nursing home on Cherry Street and moved to the nurses home on campus at the hospital about 1960. The only reason I know that date is that I have the big Steel architect plaque that hung on the nurses home and it now hangs in my carport on Hildegarde and I was just reading it this morning and all the people mentioned on the plaque are deceased. Judy, did your mom and dad live on China Street at one time? Not that I remember. We lived on Speed Street when I was born, then moved to 2408 Oak Street, I think it was. We moved into an apartment on Bomar Avenue while we were building our house in Wildwood and we lived on Claremont Circle. I still remember that our old, four digit phone number was 2613! LOL We went to Vicksburg for one of Bob’s class dinners this summer and visited all those old places. The house on Oak Street still stands. My dad worked for ICRR, so that house was close to his work. Later we moved close to Mama’s work. I remember the nursing home on Cherry Street. I was born at Mercy on October 30, 1965. My doctors were Dr. Horn and later Dr. Love. I remember the two white haired ladies that were in the pediatricians office sitting behind a light green tile window. I knew I would be feeling better soon. They were like two angels in my young mind. I would love to see the inside of that beautiful old building again. Does anyone else remember these ladies? Thank you for giving this some thought. My sister and I also had our tonsils taken out by Dr. Masterson on the same day and shared a room in the hospital. Only time I guess I was admitted as a patient. who owns this hospital now. Who knows!!!!! That has been a wonder for all and especially those of us who live in the subdivision adjoining the property. We heard YEARS ago that some attorneys from Jackson purchased it. Do not know if that is true or not. I am sad to see our beautiful Mercy Hospital in such bad state. I have very great happy memories of “MERCY”. I graduated in 1960 and retired from nursing in 2006. I worked at Mercy Hospital in the emergency room that was right underneath that big cross on the front. I first went to work there they had just opened the new emergency room in the new wing replacing the old emergency room in the back. It was a completely different time in the medical field. It was when doctors and nurses still cared about the patients and were connected. I have many fond memories of working in the emergency room. I’m sure many of the individuals I worked with her no longer with us . My second son was born at Mercy Hospital. That was a number of years after I work there. Yes Jack, a lot of the former nurses are no longer with us. I remember you very well. I left as the head nurse of 5th floor to go and be the head nurse in the ER. I can not recall the year but I took Georgia Marshall RN position and it was soon after the new ER was built and I worked in that Dept for 25 years. This was prior to having ER physicians. There was no such thing in those days. It was me and an orderly who happened to be an conscientious objective who was serving his time. Shirley, I remember you well. I was an ER orderly. I those days they let us do many things. I worked patient care on the 5th floor sometimes when it was short of nursing assistance. Me and a Mr Day were there at the same time. We use to have to wear lab coats and many people thought he and I were young doctors. Yes I remember there were no ER doctors and I also remember if it wasn’t an emergency you were sent home. I wish sometimes I had gone on to be an RN like you. I had great respect for RN’s like you. In those days so did the doctors. I wish you a Very Happy New year and many more. I never entered the medical field after High School which is when I worked at Mercy I went into mechanical industry. I retired a couple of years ago at 58. I was born at then parkview in March of 2001, so I know for sure it was open then, hope this helps on timing! My husband’s birth certificate says DOB 12/02/45 at Mercy Hospital in Vicksburg. Was there an earlier hospital named Mercy? The original Mercy Hospital was downtown on Crawford Street near the city post office. Not sure when the one on Grove Street was built but all patients and services were move to that location when it was built–Mercy Hospital Street Memotial. There were three Street brothers who were physicians and they originally owned the hospital and they gave it to the Sisters of Mercy. It just came to my mind that it was 1957 when the downtown Mercy Hospital moved out to the newly built one on a Grove Street. I was a senior in HS and I remember standing at the window of the school watching the patients being moved. I just happen upon this thread while trying to find out my time of birth. I was born at Mercy 12-11-1964. Do you know if times where record by the hospital? I live in NC and sure miss MS. My grandmother had a hair salon called The Carriage salon . My mother and sister both went to Mercy school. Yes Blaine, all deliveries were recorded in delivery area of all births and the time of delivery was part of the data. Now, your birth certificate also should have the time. Blaine, I am a Vicksburger and I graduated from St. Francis in 1957 and the school was run by the Sisters of Mercy. I am also a graduated of the Mercy School of Nursing in 1961. Stayed on working at Mercy (45 years) til I retired in 2003. . I am interested in knowing who your mom and sister were since they also went to the apparent same school. I am not sure why my birth certificate does not have my time of birth on it. When I called the state they said that the hospital may have that information but they only have copies of my original certificate that the hospital filed. My mother was Peggy Ann Calcote and her older sister was Janice Calcote. They both have passed away within the last 2 years. My grandmother Maddie Hunter owned the Carriage Salon for 30 years. Thank you for taking time to respond to my email. I love Vicksburg it has many fond memories. I only lived there until I was 8 and we moved to Brookhaven but spend every summer there with my grandmother. OMG Blaine I knew all three of them. Janice and I were in the same graduating class at SFXA in 1957 and Peggy was just right behind us. I also am familiar to their home on the Street between Polk and National. I knew that they had both passed on to the glory land. I am still kicking and very active at the age of 78. Now, you continue to cherish the fond memories of your childhood.